The modern Catholic, and most Christians for that matter, has many fronts to defend, one of them being the so-called “pagan roots.” This accusation is made on many facades of the faith. For example, an objector might tell you that Christians adopted the Holy Day of Easter from the pagan celebration of the fertility goddess, Ishtar (sounds a little like Easter, right?). This time of year though, you are likely to hear the objection that Christmas is a christo-pagan holiday, a mash-up of pagan belief and Christian celebration. Here are some of the objections or accusations you might meet, and a helpful way to respond. 1. Christians invented Christmas from the winter solstice celebration of Sol Invictus. Yes, there were mid-winter celebrations in religions outside Christianity during the time of the Early Church. In fact, like Easter, the East and the West were observing Christmas differently, while until recently, the Armenians didn’t celebrate it at all. The West led the way with a distinctive nativity-based celebration, concluding with Holy Mass. That’s the same as how you see it today. The development of Christmas was not an assimilated celebration until the 4th century. Does that mean that the Apostle John, and Sts. Polycarp and Irenaeus, three men who were apostolically connected, did not celebrate Christmas? Probably so, but there is nothing wrong with this. Merely because a Christian celebration is similar to that of a pagan one proves nothing. There is either coincidence of the celebrations in the same time period or there is influence on one another. The objector has to ask himself the following: 1) after centuries of persecution for not observing pagan holidays, where is the proof of influence? Or/and, 2) who influenced whom? Did Christianity have the influence on pagans to begin adopting a more public and concrete celebration or did we “Christianize” a pagan event? We can observe that the two were present at the time but neither scenario is a problem with the Christian because the Church has the ability to Christianize people and celebrations alike. Light was overcoming darkness at the celebration of Sol Invictus and in Christ, darkness was defeated by the real luminousness of Christ. Paganism had a hint, but Christianity had the answer. 2. 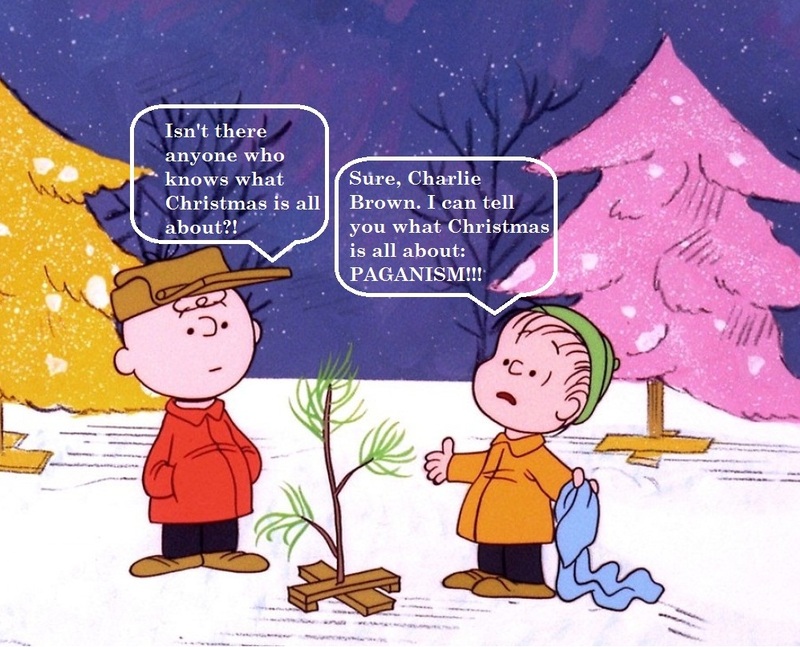 The Christmas tree comes from pagan origins and is condemned in the Bible. The passage in the Bible your objector is referring to comes from Jeremiah 10:3-4. Thus says the LORD: Learn not the customs of the nations, and have no fear of the signs of the heavens, though the nations fear them. For the cult idols of the nations are nothing, wood cut from the forest, Wrought by craftsmen with the adze, adorned with silver and gold. With nails and hammers they are fastened, that they may not totter (NAB). Let’s get one thing straight up front: Jeremiah was not talking about Christmas trees because he was writing hundreds of years before Christmas became a celebration. He was pointing out the idolatry of the people of that day, and much like Tertullian, was warning against the idolatry of those who put there hope in earthly gods and things. Near to this, the objector must understand that Christians are not intent on worshiping their trees and are certainly not putting them in their living rooms and entryways to deter spirits. Perhaps for some carolers and eggnog, but not for protection. There is nothing wrong with the Church “baptizing” certain practices of other religions. The objector is confusing the Church of deriving its beliefs from these celebrations, with the assimilation of seasonal celebrations and symbols. Like St. Patrick did with the clover to illuminate and demonstrate the reality of the Trinity. Akin to St. Paul explaining the “unknown god” at the Areopagus. Paul did not derive the idea from the Greeks that day, and Patrick did not derive the Trinity from a leaf. We don’t believe that Christians hold the patent on Truth. Instead, we believe that God has riddled himself to other religions. In other words, just because a specific religion does not contain the whole truth, does not mean it contains no truth. If you witness to a pagan who believes a wreath will save him, maybe you can show him how Jesus is the fulfillment of that promise of everlasting life. Then, just as with the cross that hangs from our necks, we can display a wreath to remind us what is true. In this way, Christianity has the distinct ability to assimilate the “hints” of other religions. Fr. Dwight Longenecker writes, “If a religion is not only true but more true than all the other religions, then it should connect with all those other religions at the points where they are true.” Read “Paganism, Prophecies, and Propaganda” HERE. God has very specific instructions in regards to His Law and His commandments. There is no way to spin it. It’s not about the imaginings of man. It is what God demands of His people. 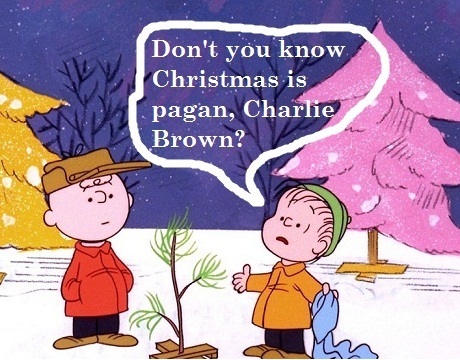 “Christmas” wasn’t celebrated until well in the 300’s when it was used as a “tool” to convert pagans to Christianity. The Emperor made it so the popular festival could still be celebrated. But God demands we keep His commandments. He HATES the ways of the Pagans and how they worship their gods. He HATES it. You can’t “spin it” and think God will just change his mind. He said….DON’T DO IT!!! Thank you, first of all, for your comment Justin. The dialog is appreciated and always welcome. My question to you is: do you celebrate Christmas and/or Easter? Second: you cite Deut 4:2, but are you subject as a Christian to the OT laws? you are misquoting the sciptures, but don’t let that get in the way….. It is not possible to misquote the scriptures.